For our entire generation, going on Birthright has been seen as a rite of passage in our Jewish journey. And, for decades, Birthright’s programming has been funded by right-wing donors and designed to obscure, rationalize, and defend the Israeli Occupation. We can no longer allow a free trip that hides the truth be synonymous with being a young Jewish person in America. Join us in demanding Birthright confront the crisis of the Occupation. MARK THE WEST BANK ON EVERY MAP. EDUCATE PARTICIPANTS ON THE DAILY NIGHTMARE OF THE OCCUPATION . SHOW A CHECKPOINT FROM A PALESTINIAN PERSPECTIVE. TO SEE WHAT THE POLICIES OF OCCUPATION HAVE DONE TO THE CITY. 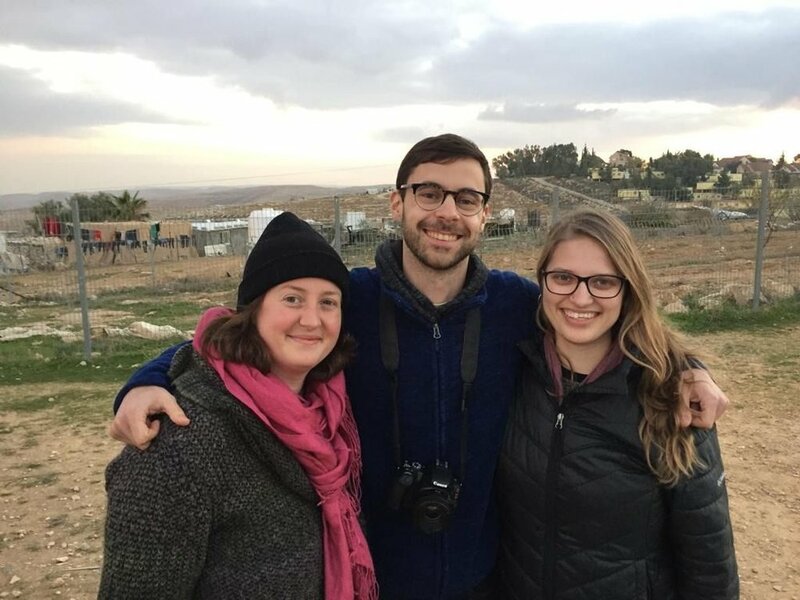 During winter 2018/2019 Birthright trips, three participants were kicked off their trip for asking questions about the border wall and the Occupation. It’s clear — Birthright only wants Jews who will accept their right-wing agenda without question. We refuse to remain silent, and demand that Birthright confront the crisis of the Occupation. Even though their flights were cancelled and they were left stranded in Tel-Aviv, they went to Umm Al Khair, a village that’s been under threat of demolition for years, along with other anti-Occupation activists to support the community and bear witness to the Occupation. We have everything you need to ask questions on your trip: maps of the region, facts about Israel/ Palestine, what to do when extending your trip, our Liberation Syllabus for learning more about the Occupation, and more! This above West Bank map is a physical representation of how the Occupation plays out in the West Bank. The area in blue marks expanding Israeli settlements, while the brown marks Palestinian land. In the map, one sees the blue area of settlements encroaching on Palestinian cities and villages while also cutting them off from one another. This is why the West Bank is sometimes described as 'swiss cheese' or an archipelago; Palestinian areas are becoming increasingly smaller islands distanced from one another by expanding settlements. Not so many years ago, the brown area of Palestinian land was contiguous. We are building a vibrant and inclusive movement within the American Jewish community, across generations and organizational affiliations. This movement is open to any who seek to shift the American Jewish public away from the status quo that upholds the occupation. How do I reconcile with the fact that Birthright, a Jewish space, doesn’t uphold the Jewish values I’ve been taught to cherish? We’re encouraged to analyze, to challenge, to question. But why not here? Birthright is missing a crucial component of our Jewish tradition — asking questions. What does this tradition become if we bury some of its most basic values in that process? Our movement depends on the generosity and support of our community. Our orientation training is the essential building block of IfNotNow. Through attending one of our trainings, you will get the tools and materials necessary to start participating as a full member of IfNotNow. To sign up for a training or to express general interest in attending a training, please click here and complete the form. If you express interest in a city where we currently have trainings, you will then receive a Google Form to register for a specific date. If we aren't in your city yet, we hope to be soon. IfNotNow members and supporters get together regularly, for actions, community events, and meetings. Find out what’s happening near you by locating your city in the map of IfNotNow locations. Let us know about your Birthright experience.